Retire in Tallahassee Fast becoming one of the most popular places for retirees. Retire in Tallahassee, Florida, to enjoy the more cultural diversity than any other city in the U.S. A college town with two universities, Tallahassee is affordable and incredibly beautiful. It is fast becoming one of the most popular places for retirees. No wonder! With its natural environment, you will be able to participate in many of the recreational resources available in this area.In addition to its museums, parks and festivals, Tallahassee residents can participate in such activities as: bicycling; hiking; jogging; using their St. Marks Historic Railroad State Trail which is sixteen miles long. Another famous trail is the Apalachicola National Forest encompassing 68 miles of pure scenic beauty. 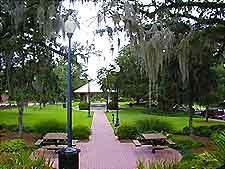 Moreover, their parks offer scenic trails, for those of you who love the outdoors would want to retire in Tallahassee. For shopping, the downtown market place offers crafts, live jazz concerts, and features authors, poets, chefs, and a farmers' market! Can’t ask for more than that! Their festivals are wonderfully entertaining, featuring dances, music, golf tournaments, costume balls, carnivals, parades, and events for even the most discerning among you. The Tallahassee Film Society presents foreign, independent, and documentary films on a limited-showing basis. The Monticello Opera House offers productions of drama, comedy, musical theater, live radio theater, murder mystery dinner theater, and Jazz in the Garden. Just minutes from Tallahassee, the Quincy Music Theater is North Florida’s largest and only all-musical community theater. The facility is located in the Leaf Theater in Quincy, Florida’s beautifully restored downtown historic district. This is just the tip of the iceberg when you retire in Tallahassee! Dance; history and heritage; museums; visual arts – there is just no end to the many events you can participate in. Tallahassee has more than you ever thought one city could have; and more. With its affordable housing and fantastic climate, you can look forward to a retirement filled with fresh air; incredible landscapes and cultural activities. Although Tallahassee, Florida is one of the cheapest places to retire, it is certainly one of the best. St. Marks Historic Railroad State Trail is a rail trail and Florida State Park located on 16 miles of the historic rail bed of the Tallahassee-St. Marks Railroad, which ran between Tallahassee and St. Marks, Florida.The trail ends near the confluence of the St. Marks and Wakulla Rivers. In 1984, the Florida Department of Transportation purchased 16 miles of the corridor to preserve the right-of-way. The recreational trail was constructed and is maintained by the Florida Park Service. Today, people of all ages, abilities and incomes can enjoy using the trail. Not to miss! Tallahassee's Farmer's Markets are notably fresh and bountiful with local vegetables and fruits. Fresh bread and eggs are available. Look for fresh cut flowers andnative plants. Local musicians play their music on stage, authors and poets present readings of their latest books, and regional artists show their artsand fine crafts. Special events bring hands-on art activities for children or sneak previews of upcoming cultural events. Live Music, Food & Fun every Saturday, March through November.